David Wain directs and co-writes The Ten, ten stories inspired by each of the Ten Commandments. Ken Marino co-writes the screenplay and also plays Dr. Ritchie in the "Thou Shall Not Kill" segment. David Wains has previously directed and co-written Wet Hot American Summer and some episodes of the TV series "The State". Ken Marino had also written some episodes of "The State" and acted in films such as Diggers, The Baxter and Wet Hot American Summer. I had the privilege to interview them together. 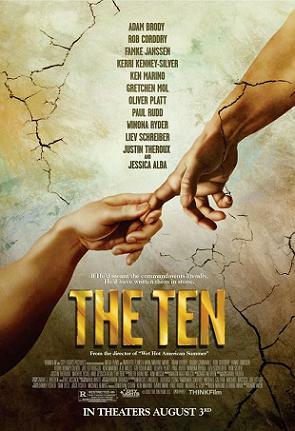 THINKfilm will release The Ten on August 3rd, 2007. NYC MOVIE GURU: How did you come with the different Commandment pieces? KM: David and I have been writing since we were on “The State” together. A lot of times, back then, we would do these writing exercises where we would write a title and put it in a hat. Somebody would pull it out and would have to write a skit based on that title. I think that we basically used The Ten Commandments in the same way. We’d come up with five different pieces and then we’d pick the one that was the funniest and that would work well within the context of the [movie]. DW: It was like doing ten different movies. Each one had a different style to it. In some ways, it was ten times the work. For each piece, we had a different set of locations and a different set of actors, so it was a lot of work. We shot it in the same number of days as Wet Hot American Summer. That was shot in one locations; this was in over forty locations. NYC MOVIE GURU: Does your screenplay have any kind of structure? KM: It does have some sort of a three-act structure where, by the end of the second act, you’re kind of at the lowest of the low with these characters and then the third act is much happier. NYC MOVIE GURU: Did you write any of the parts with a particular actor in mind? DW: The mother was the only part that we wrote for a specific actor, Kerri Kenney-Silver. For the rest of the actors, we had the finished script and we just went to actors that we loved and said, “Will you do this?” and a shockingly high percentage of them said “Yes”. NYC MOVIE GURU: How did you know how far to go with the comedy? DW: There was stuff that we cut because it wasn’t funny or because it was too expensive or because it was too long. Our guiding point in everything we’ve done in our career is [that] it’s not too far if it’s funny. NYC MOVIE GURU: Were any of the scenarios purposefully chosen based on the actors’ personal life, such as the Thou Shall Not Steal commandment starring Winona Ryder? DW: All of it is coincidental, but because cast are high-profile actors, it’s fun to make those connections. NYC MOVIE GURU: Describe a piece that you had to leave on a cutting room floor. DW: We had a very original piece which was the adultery Commandment: A husband and wife team back in the 50’s did a sketch about a nuclear bomb, but when they were [performing] it in the actual theater, coincidentally, a nuclear bomb did [explode]. After it hit, you realize you’re watching a movie about team doing the sketch and then the bomb hitting. The whole thing is a movie. But then, on the movie set that they’re shooting, a real nuclear bomb [explodes] and it goes on and on and on. It was obviously a very expensive and weird piece. Also, the Arnold Schwarzenegger piece has layers of comedy that were taken out just for time. NYC MOVIE GURU: What surprised you most while filming The Ten? DW: It was surprising how many did [get naked]. A lot of those guys are our investors. It was important to us, creatively, that the naked people weren’t, like, these buff guys; they were regular guys. Our investors and producers really fit into that. NYC MOVIE GURU: Did you write the movie considering what kind of audience will respond to it? KM: We wanted to make a movie that we thought was funny and that was different, so we tried to do that. DW: It’s just hard to write something with that in mind, so we really just tried to please ourselves. If you’re heading in the [mainstream] direction, you’re going to get something close to I Now Pronounce You Chuck and Larry. If you want to make something that’s personal and really makes you laugh, then you’ll make The Ten.